The new model could open a new chapter in the development of therapeutic strategies for bone metastasis and cancer progression. Researchers at Tokyo Institute of Technology propose an improved mouse model that could revolutionize bone metastasis research. Their method, which involves injecting cancer cells via the so-called caudal artery in the mouse tail, overcomes many limitations of traditional mouse models. The new model could thus open a new chapter in the development of therapeutic strategies for bone metastasis and cancer progression. In a study published, a group of researchers led by Takahiro Kuchimaru and Shinae Kondoh of Tokyo Institute of Technology (Tokyo Tech) present a mouse model that could greatly improve understanding of the underlying biology of bone metastasis. It is widely known that metastasis -- the spread of cancer cells from a primary tumor to other parts of the body -- is one of the main causes of cancer mortality in humans. Bone metastasis commonly occurs when cancer cells spread to the bone from tumors originating, for example, in the prostate, breast, lung and kidney. Experimental mouse models provide vital clues as to how cancer cells proliferate and how treatments could be developed. For the last 20 years, a model based on intracardiac (IC) injection has been considered the "gold standard" for inducing bone metastasis. This model involves injecting cancer cells directly into the left ventricle of the mouse heart. It requires a high degree of technical expertise, and even when performed successfully, the number of cancer cells that can be injected at any one time is limited. Another drawback is that the IC model tends to be more suitable for studying cancer cell lines that have a relatively high metastatic ability, ruling out analysis of "weaker" cancer cell lines. In contrast, the new method developed by Kondoh's group involves injecting cancer cells via the caudal artery (CA) in the mouse tail -- a procedure that can be performed much more easily as the artery is visible on the body surface. This method allows researchers to inject a larger number of cancer cells without causing acute death: In the present study, around one million cells were injected without any acute death. Moreover, the new method provides a new way of studying cancer cell lines with low bone metastatic potential. The researchers emphasize that the CA model predominantly ensures that bone metastasis develops in the hind limbs with much higher efficiency. Using bioluminescence (BL) imaging, the team was able to detect bone metastasis just five to twelve days after CA injection of all cell lines examined. "Overall, the results demonstrated that CA injection provides a reliable method to develop bone metastasis by increasing the delivery efficiency of a wide variety of cancer cell lines to the bone marrow of the hind limbs in mice," they say. In addition, the CA model enables scientists to monitor the progression of bone metastasis over a longer period of time compared with the IC model due to reduced incidence of lethal metastasis in other organs. This represents a big step forward for investigating cancer cell dormancy and reactivation in greater depth. The researchers conclude: "Our model may open a new avenue for understanding the bone metastatic processes and development of drugs preventing bone metastasis and recurrence." 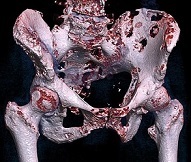 Illustration: 3D rendered CT scan of bone metastases of the hip bone, in a 60-year-old woman with parotid gland cancer. Large lesions are seen on the ilium on the more distant side. Involvement of the vertebral column has caused a compression fracture. Wikipedia.